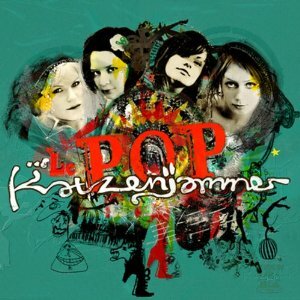 I’m very happy to be writing this review; a little over a year ago, I did a Owl-Stretching Time post about Norway’s Katzenjammer and their great song “Demon Kitty Rag”. In the post, I mentioned that the album was coming out that August. While that turned out to be wrong, the album, Le Pop, HAS finally come out on June 29th. And I’m glad to report that the entire record is as good as “Demon Kitty Rag” — I feel the same gobsmacked joy listening to the full album as I did when I listened to that song the first time. The album continues in the vein of the cabaret, ragtime sound; the feel is kind of like a Weimar-era Ditty Bops. Considering that the Ditty Bops are one of my favorite bands of all time, that’s definitely a good thing. I’m not sure if Katzenjammer would fit in with the “Dark Cabaret” scene, though — they’re not really that dark. They’re much more fun — but not at the expense of depth. “Tea With Cinnamon” is a beautiful song; “Play My Darling, Play” is a poppier-sounding song about the dangers of being stuck on stage without exploring the world. Katzenjammer themselves are pretty impressive too; the band is four women who can play, well, seemingly about 50,000 musical instruments between them. The website pictures them with horns, accordions, balalaikas, guitars, drums, and that’s not the end of it. It’s hard to pick out all the different types of instruments I hear on the record; of course, the matter isn’t how many instruments they play, but how well. After all, I can play guitar, keys, bass, drum machines, banjo and harmonica, but none of them WELL. But Katzenjammer are all musical ninjas and I’d bet they’d be able to make beautiful music with a tin can and a rusty mandolin string. Le Pop is definitely a contender for best album of 2010 — and there’ve been a lot of good records this year, and it’s only barely half-over. Still, though — if I were the betting type, I’d put it all on Katzenjammer. Norway’s already known about this wonderful record since 2008, so, assuming the petty and jealous don’t get them knocked off on a technicality, this album should be — and will be if I have anything to say about it — #1 on every critic’s best of 2010 list come the last week of December. Help me name my new boat.